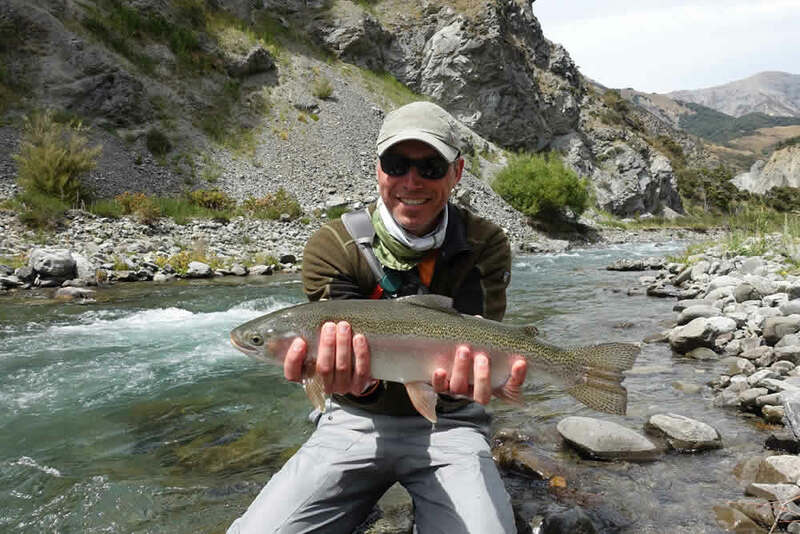 Let a highly-experienced NZ fly fishing guide take you to pristine rivers and streams within the High Country of Canterbury and the West Coast of the South Island – all with complimentary pick up and return to Christchurch. 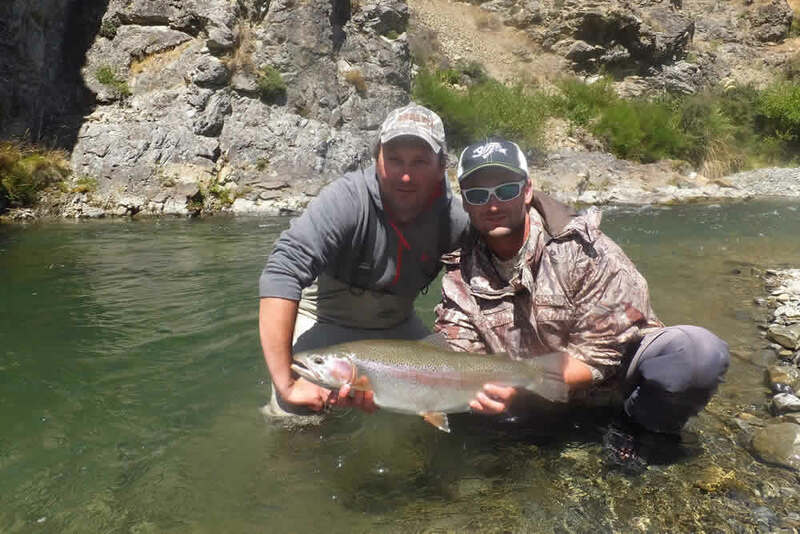 New Zealand Fly Fishing Escapes delivers authentic Christchurch trout fishing charters. There are many opportunities to spot, stalk and cast to large wild trout in crystal-clear spring creeks, small remote freestone rivers or on alpine lakes. 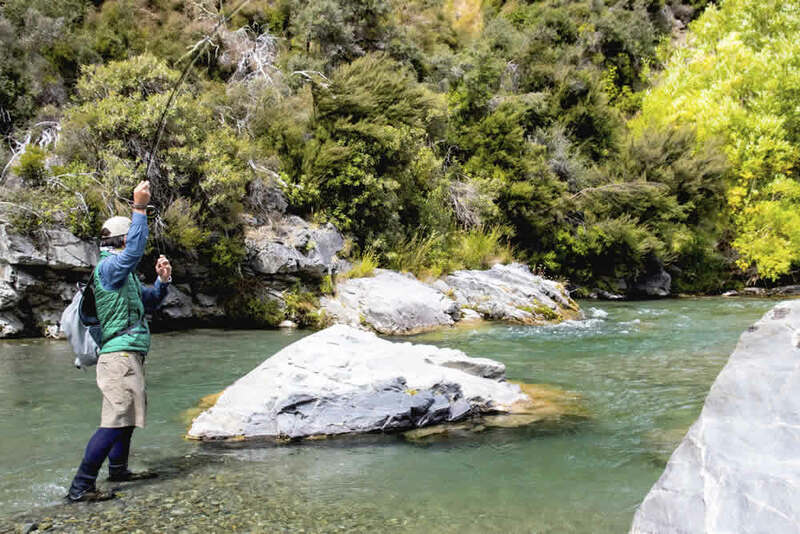 New Zealand Fly Fishing Escapes will take you off the beaten track to access more remote waters and experience some of NZ’s wild and unspoilt wilderness fishing. Every fishing trip provides ample opportunities to experience NZ fly fishing at its best. All fishing trips are tailored to the needs and experience of each individual client and are guaranteed to be a great day out in some of New Zealand’s most spectacular scenery. Your NZ fly fishing guide tailors every day to your needs and experience. 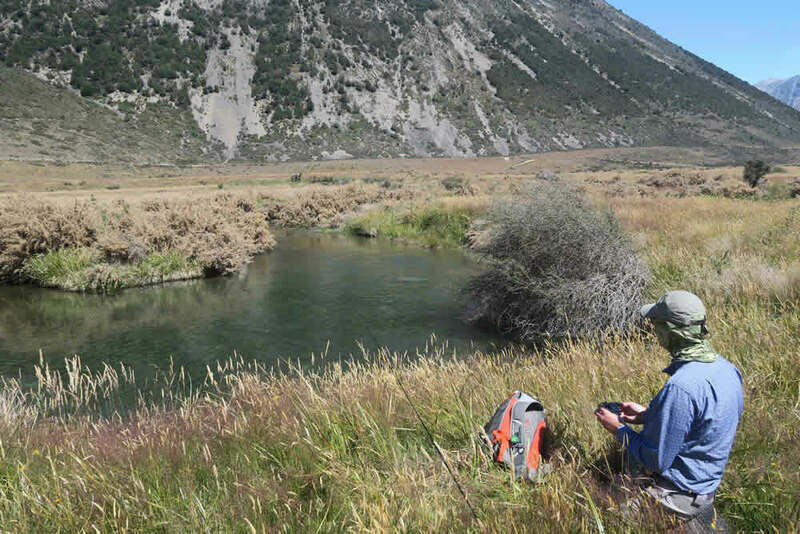 Our Christchurch trout fishing charters cater for everyone from anglers with mobility issues through to advanced fly fishermen, seeking a challenge; from single- to multi-day trips. Coupled with comfortable, private lodge facilities and on-site restaurant/bar, New Zealand Fly Fishing Escapes are ideal if you are seeking a truly remote, authentic and memorable NZ fly fishing trip of a lifetime. Heli fishing is an unbeatable experience. This luxury trout fishing charter sends you soaring across the majestic Southern Alps to remote streams in the Canterbury High Country and/or West Coast region. Your NZ fly fishing guide will show you exclusive spots to stalk large, wild brown and rainbow trout in rarely-fished waters. 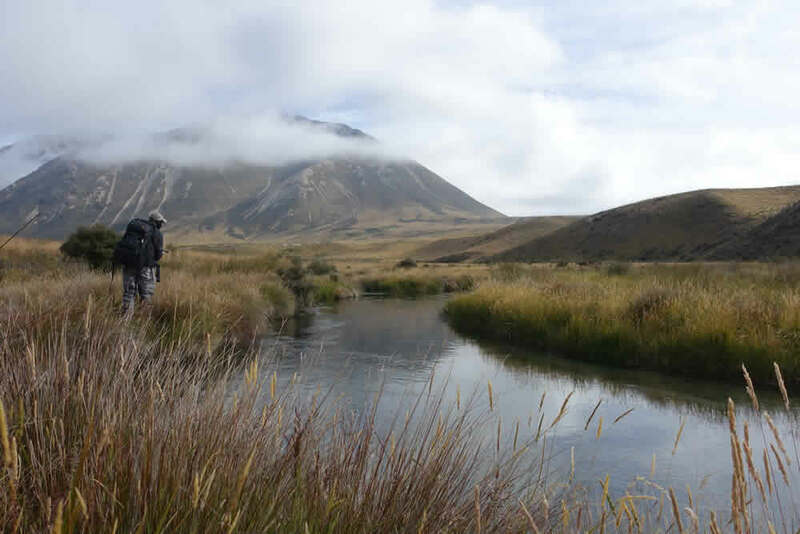 With New Zealand Fly Fishing Escapes you get the chance to experience NZ wilderness fishing at its very best. The grounds of Flock Hill Station and their surrounds offer so much more than world-class New Zealand fly fishing. You’ll find an abundance of walking and hiking treks, beautiful spots for picnics, climbing and mountain biking. Flock Hill Station also offers stellar horse trekking adventures. If you’d like to venture further afield, catch the famous Tranzalpine Train to Christchurch or the West Coast. 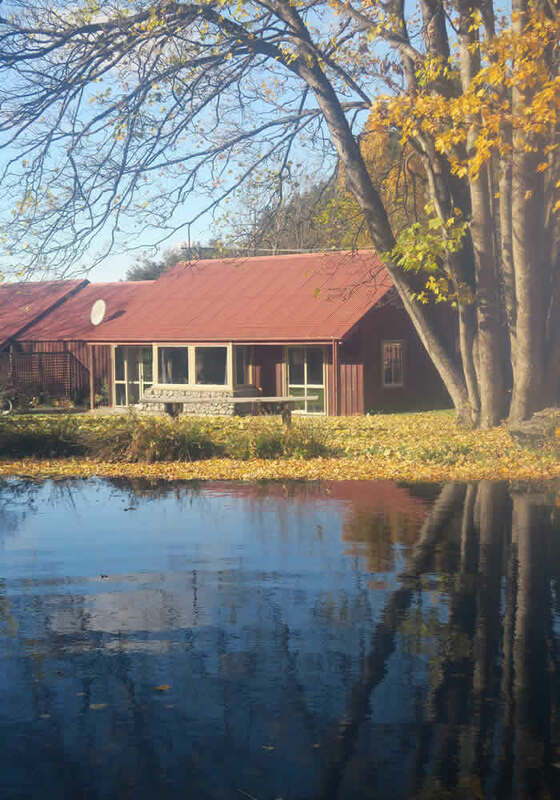 90 minutes from Christchurch, our fishing lodge consists of 5 multipurpose-built cottage suites, ranging from 2 to 4 bedrooms, with separate lounge and bathroom facilities. Your boutique fishing accommodation is located in an extensive and meticulously maintained garden complete with a lake and native plantings, just a short stroll from the main lodge building which houses the restaurant and bar. Enjoy panoramic views of the surrounding garden and mountains beyond as you spin a yarn after a great day’s fly fishing—simply book your NZ fishing guide and accommodation as a package! With so much to do, from relaxation through to hiking and horse trekking, it really does make sense to extend your fishing trip with some non-fishing activities and stay in this beautiful area a little longer. In the evenings, enjoy an à la carte dinner and sample from a range of local wines and other beverages at the bar as you reminisce on the day’s adventures with like-minded guests. The landscape of Flock Hill is arguably one of the most diverse and picturesque of any working farm in New Zealand, comprising vistas of braided rivers, small meandering streams, an alpine lake and extraordinary rock formations. This area is not only a unrivalled destination for Christchurch trout fishing charters: Testament to the stunning beauty and uniqueness of this area, several scenes for the movie ‘The Lion, the Witch and the Wardrobe’ were filmed at Flock Hill. These locations can be visited first-hand on a guided fishing trip through this ‘Narnia-like’ landscape. Flock Hill‘s hunting and fishing lodge is located on the main highway between the East and West Coast of NZ’s South Island, making it an ideal stopover for those driving over the Southern Alps. The world–famous TranzAlpine Train Journey also passes through Flock Hill Station. With a train stop just 30 minutes‘ drive from Flock Hill,you can join the train ride at nearby Arthurs Pass. We are more than happy to assist with your travel arrangements to and from Flock Hill Lodge—just ask us for assistance. 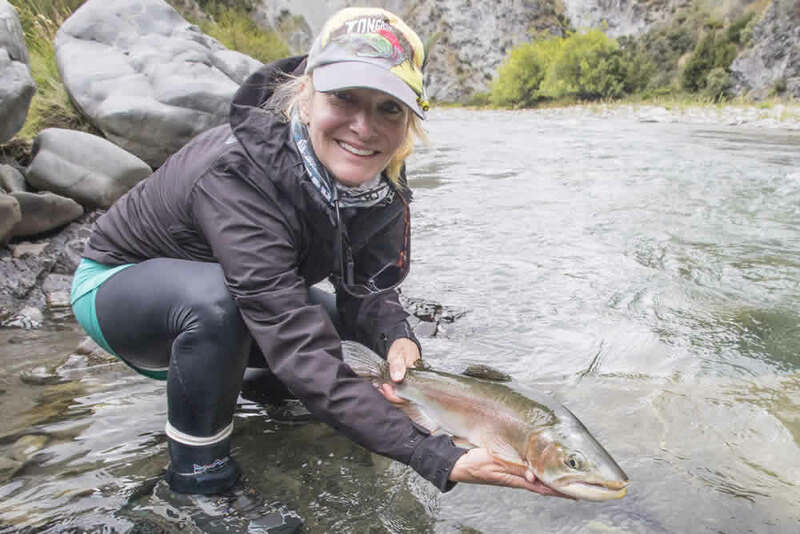 2019 New Zealand Fly Fishing Escapes. All Rights Reserved. Website & SEO by WebWords.